A big, warm, and welcoming ‘Hello’ to all of my new TASIS science students! I have a question for you: Do you collect things? Rare coins? Postage stamps? Books? Comic books? Music? Movies? One of my favorite earthly scientist collectors was Alfred Russel Wallace, a British explorer, collector, naturalist, geographer and anthropologist (among other talents) who lived from 1823-1913. A.R. Wallace is perhaps most famous for his contributions to the theory of evolution by natural selection, a theory that he co-authored with Charles Darwin, but these days it is a piece of his furniture that is receiving a good deal of attention. 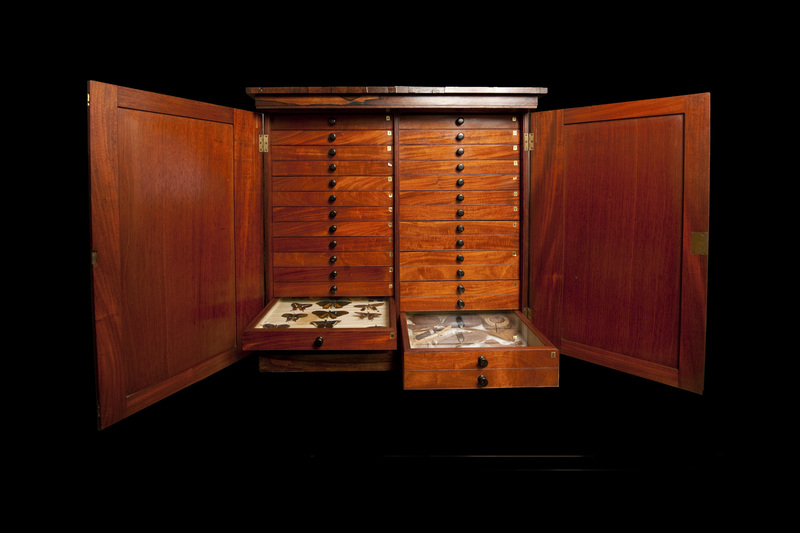 A couple of years ago, one of Wallace’s specimen cabinets was put on display at the American Museum of Natural History (AMNH). It is a beautiful piece of furniture made from finely crafted rosewood and it contains nearly two thousand sorted and labeled beetles, moths, and plants. A photo of the cabinet can be seen at right (if you click on the cabinet you can see a larger version), but if you want to see some of the specimens housed inside of the drawers you’ll have to click HERE and read a 2009 article by Jennifer Viegas on DiscoveryNews.com. Enjoy!